This tutorial is intended as a supplement to the information contained on the Physics' Department website: Plotting and Fitting Data and Plotting Data with Kaleidagraph. It shows how to perform the same functions described in those tutorials using gnuplot, a command-line-driven plotting program commonly available on Unix machines (though available for other platforms as well). You may find it helpful to look at the other tutorials as well; this one is intended to follow them quite closely. The instructions and samples given correspond to version 3.7 running under Linux, but the results should be similar everywhere. If you are using an older version, however, you might find a few of the more advanced features missing. gnuplot seems almost the antithesis of Kaleidagraph: the the Kaleidagraph tutorial calls Kaleidagraph "an easy-to-use if somewhat limited graphics program". gnuplot is a not-quite-as-easy-to use, though extremely powerful, command-line plotting program. Running gnuplot is easy: from a command prompt on any system, type gnuplot. It is even possible to do this over a telnet or ssh connection, and preview the graphs in text mode! For best results, however, you should run gnuplot from within X Window, so that you can see better previews of your plots. All the data sets you use in gnuplot should be typed into a text file first. There should be one data point per line. Each data point will consist of several numbers: the independent variable, the dependent variable, and optionally error bars. Each of these fields should be separated by a tab. Actually, any number of fields may be specified on each line; this is useful if you have multiple measurements for each data point, for instance. For information about how to access this additional information in your plots, see (fixme: add section) below. You may include any extra information you want in the file, such as a description of the data, headings for each of the data columns, and so on, as long as each such line begins with the comment character, #. The dataset used in this example is available in the file cavendish.data. Here, the y range will be automatically determined. plot [t=-4:4] f(t) title "Bell Curve", t**2 / 16 title "Parabola"
Note that commas are never used except to separate distinct functions. If you would like a curve not to show up in the legend, set its title to "". set title "Some Sample Plots"
set xlabel "Independent Variable (no units)"
set ylabel "Dependent Variable (no units)"
to replot the last functions given. After learning how to plot functions, now it's time to learn how to plot data. The syntax is almost the same, except that instead of specifying a function, you must specify the name of the file containing the data to plot, enclosed in double quotes. When plotting data, it usually isn't necessary to specify ranges for the independent and dependent variables, since they can be figured out from the input. If necessary, of course, you can always give them. It's possible to plot x error bars using xerrorbars, or both x and y errorbars using xyerrorbars. When both x and y error bars are used, there must be four columns present, and x error bars must be specified first in the data file. More variations are possible; see the online help for more information. plot "cavendish.data" with yerrorbars title ""
You'd get a rather strange error message: undefined variable: title. If you see error messages like this, check the ordering in your plot commands. If you're unsure, typing help plot should get you straightened out. No plotting program would be complete without the ability to fit our data to a curve. For the Cavendish experiment, we'll need to fit our data to a sinusoidal curve with exponential decay. gnuplot supports these nonlinear curve fits, and can even take the experimental uncertainties of the data points into account. For a non-linear curve fit such as this, it is often necessary to provide an initial guess for each of the fitting parameters, or the fitting attempt may fail. For simple equations, such as polynomials, this will not be necessary (but never hurts). Here's how the command is interpreted: fit tells gnuplot we're doing a curve fit. The next part, theta(x), must be a function that we're using to fit the data. Here we must use x as the independent variable. The next part, "cavendish.data", must be a datafile containing the data we wish to fit. The using 1:2:3 tells gnuplot to take columns 1, 2, and 3 from the data file and use them as the x, y, and uncertainties, respectively. If this part is left out, then the experimental uncertainties will not be used for the curve fit. See below for a greater discussion of the extremely powerful using qualifier. Finally, we must tell gnuplot what variables it can adjust to get a better fit. For this case, we say via a, tau, phi, T, theta0. Important quantities to note are the reduced chi square (variance of residuals), which in this case is 1.15, and the values for each of the fitting parameters. Each fitting parameter also has an uncertainty listed. The correlation matrix at the end can ususually be ignored. 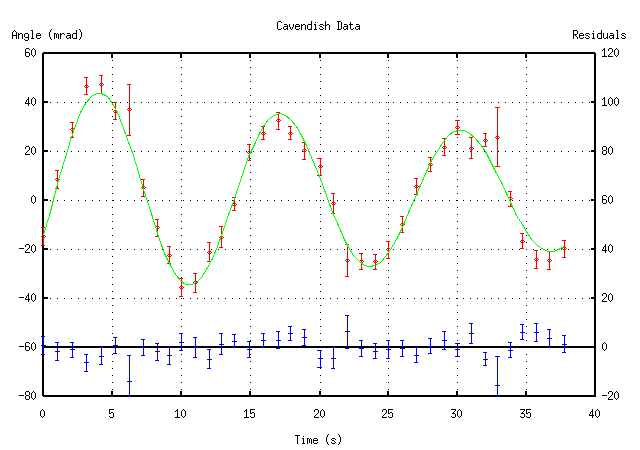 plot "cavendish.data" title "" with yerrorbars, theta(x) title "Best-Fit Curve"
The using qualifier used in the fitting command above is an extremely powerful tool in gnuplot. With it, you can exercise almost limitless control over your data as it is plotted. gnuplot usually expects a certain number of data columns when it uses a data file (whether for plotting or fitting). Usually, only two columns are used: the independent variable and the dependent variable. With error bars, one or two more columns may be used. Usually, these columns are taken out of the datafile directly. Sometimes, it's necessary to exercise a little more control. That's where using comes in. The using command expects several values, one for each column of data required, with each value separated by a colon. If the value is simply a number, gnuplot will take that data piece from the specified column in the datafile. In this case, we tell gnuplot to take the independent variable from column 2, and the dependent variable from column 1.
plot "double.data" using 1:2 title "Series 1", "double.data" using 1:3 title "Series 2"
In our fitting example above, by specifying using 1:2:3, we were forcing the fit command to take three columns as input, instead of the usual two (to include the error information), but we did not perform any reordering on them. Note that as part of a using qualifier, ($2) is exactly equivalent to 2. For another example, see the next section: plotting residuals. To understand this section, you'll need to have understood the section "Using using" above. A little explanation of the using statement is perhaps in order. We're producing a plot with y error bars, so we need three data columns. Hence, the using qualifier has three parts, separated by colons. The first, 1, says the first part, the independent variable, is simply the first column from the input file. The second part is an expression: we'll compute the difference between our function (theta), evaluated at the value for the independent variable ($1 - first column of data file), and the measured value ($2 - second column of data file, or dependent variable) for that point. The third column, 3, simply says to use the existing uncertainty stored in column 3 of the data file with no modification. It would be even better if we could put the residuals on the same graph as the fitted curve. To make this look good, we'll use a different scale for the residuals, so they can be separated from the rest of the graph. gnuplot allows you to use two different scales for each axis: there are independent x and x2 scales for the x-axis, y and y2 scales for the y-axis, etc. There's another syntax for defining the ranges for each of the axes, which is necessary for using more than one scale at a time. First, let's shift the graph of our data and fitted curve up a bit, to make room. plot "cavendish.data" title "" with yerrorbars, theta(x) title ""
This is like specifying the range as part of the plot command, but the settings will stick around until they are overridden, and we can specify a y-range without an x-range. The set y2tics border command tells gnuplot to display this scale on the border of the plot. Without it, the new scale would be set, but it would not be shown on the right-hand side of the plot. Here, axes x1y2 means to use the normal x-axis, and the new y axis we just defined. Here, lt -1 stands for "line type -1", where -1 is the style usually used for plot borders. gnuplot is very device-neutral: when producing your plots, it could care less whether it is producing a preview on an X Window display, an ASCII-art version for a terminal, or any other output form. The plot commands will all work the same. After getting your plot the way you like it, however, you'll want to save it or print it out. To do so, you'll want to change the output format, which can be accomplished with the set term command.